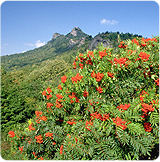 Considered a wonderful landscape species, the Mountain Ash provides three seasons of color. In spring it is laden with compact clusters of white flowers which will yield berries that turn bright red in September. By October, the large, dark green, pinnate leaves of this small tree will turn shades of yellow and orange, which with the berries are one of the brightest displays in the forest. 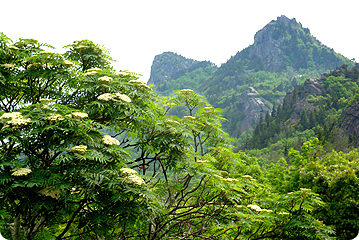 A northern species, the Mountain Ash grows on rock outcrops, balds, and margins of the spruce-fir forest at high elevations.